The Saturday night was no different from any other weekend, but Santa Ana, California has something shocking this time. 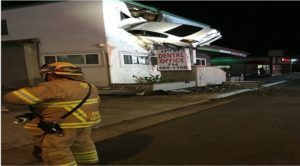 A speeding car driven by a man soared off a median divider and into a second-floor of a dental office. It was early morning of Sunday, when this real-life stunt by a man who was under drugs influence according to authorities. Interestingly, no one was seriously injured; except the occupants, who had minor injuries. The Orange County Fire Authority confirmed the same on their official tweet handle. “OCFA in Santa Ana with a vehicle that crashed into the second floor of a small Office building. The vehicle hit the center divider and went airborne and landed into the building. One person self-extricated, the other person is still trapped in the vehicle. USAR from OCFA On scene,” they rescued on of the occupants when they arrived to extinguish a fire on the spot. The Orange County Fire Authority mentioned in their official register that, “The driver, who admitted to using narcotics, will be admitted to a local hospital for observation.” So, they pursued a DUI(driving under the influence) charge against the driver and negligence of traffic rules. The fire department removed the car from the building with help of their wrecker truck. In the initial inspection, the cops found that the dirt mound in the median help to the car flying so higher. You can have a look at this obstructed surveillance video. Biker Killed in a Fatal Cougar Attack?